Showers and thunderstorms likely. Thunderstorms could be strong and possibly severe in the afternoon. Damaging winds, large hail and possibly a tornado with some storms. High 77F. Winds SSE at 15 to 25 mph. Chance of rain 100%. Rainfall near an inch.. Partly to mostly cloudy skies with scattered thunderstorms before midnight. Low 52F. Winds WNW at 10 to 15 mph. Chance of rain 50%. A host of public officials attended the ribbon-cutting to mark the new Marine Corps Junior ROTC program at Denham Springs High. 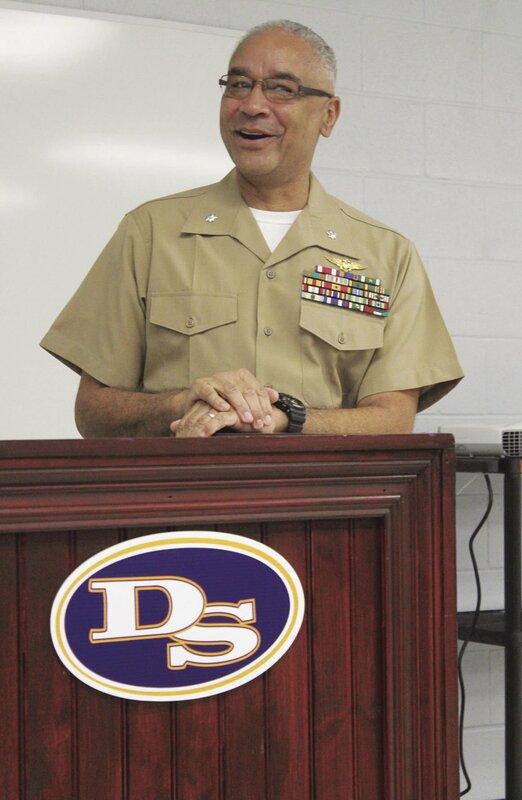 Lt. Col. Ronald Bias will be the senior ROTC instructor for the new Marine Corps Junior ROTC program at Denham Springs High School. Logan Walker, right, was commissioned as the commanding cadet of the new Marine Corps Junor ROTC program at Denham Springs High. Reading the order is Chief Warrant Officer Shawn Shortridge. Walker's rank insignia was pinned in place by U.S. Rep. Garret Graves, left, and Livingston Parish School Board member Buddy Mincey Jr., third from left. Denham Springs High School Principal Kelly Jones welcomed a host of public and education officials to the ribbon-cutting for the new Marine Corps Junior ROTC program. DENHAM SPRINGS – A rejection couldn’t stop them. A flood couldn’t stop them. Surrounded by a host of public officials and U.S. Marine Corps personnel, Denham Springs High held a ribbon-cutting to mark the beginning of its Marine Junior ROTC program. “Words can’t express how we feel today,” said Kelly Jones, principal of Denham Springs High. “The program belongs to the cadets,” said Lt. Col. Ronald Bias, an Opelousas native and LSU graduate who will be the senior ROTC instructor. Bias wasted little time in establishing that, commissioning the first commanding cadet of the Junior ROTC program. Logan Walker, dressed in his Marine Junior ROTC uniform, stood at attention as Chief Warrant Officer Shawn Shortridge read the orders, naming him the commanding cadet. His collar insignia was pinned on by U.S. Rep. Garret Graves and Livingston Parish School Board member Buddy Mincey Jr.
Graves presented Bias with an American flag that flew over the U.S. Capitol. Mincey also recounted the path the school and community took beginning in 2013-14 to bring the program here. “The Denham Springs board members were interested in the future” and offering students an elective that could create a career path, he said. “When they started talking about a program, the goal was 75 students. We will have 167 signed up for the fall semester,” Mincey said. Mincey credited Walker High Principal Jason St. Pierre, who had brought a Marine Junior ROTC program to his school, with introducing them to the proper people and helping navigate the process. “We applied and were denied. We were told at best it would be six to eight years because of congressional budget cuts and other programs ahead of us,” Mincey said. Undeterred, the Denham Springs group reached out to Garret Graves, R-Baton Rouge, who represents Livingston Parish in the U.S. House of Representatives. “If not for (Graves), we would not be here today,” Mincey said. Then came Aug. 13, 2016, Mincey said, when floodwater covered the Denham Springs High campus. “We were in survival mode,” throughout the parish, he said, as homeowners and governmental bodies struggled to assess the damage and determine how to repair it. Eleven days after the Great Flood of 2016, a Marine Corps delegation came to the school. “We showed them our vision and passion,” Mincey said. There are 235 Junior ROTC programs, according to Graves, and a new one is established when one shuts down. And having two Marine Corps ROTC programs so close together might work against Denham Springs High. “But it was a chance to compare us to other parts of the country, to see how patriotic this community is,” Graves said. The pitch was successful and in March, Bias began working to organize the program. Also on hand for the ribbon-cutting were: School Superintendent Rick Wentzel, School Board members Karen Schmitt, Jan Benton and Bo Graham, retired Army Col. Jim Springer, state Rep. J. Rogers Pope, R-Denham Springs, Denham Springs Police Chief Shannon Womack, Denham Springs Fire Chief Melvin Wheat, City Marshal Joe Shumate and City Court Judge Jerry Denton. MORNING UPDATE | Livingston Parish headlines from August 8, 2018! Check out these Livingston Parish headlines from August 8, 2018!